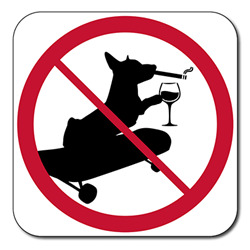 This sign might make you wonder, Does it mean: No Smoking, No dogs; no skateboards; or no Smoking dogs on skateboards? Once you have worked that out, you might then think, What IS permitted here? Use this durable and non-reflective aluminum No Smoking Symbol sign for areas on your property where pets, smoking and alcohol is not allowed. Sign can be used indoors or outdoors. Rated for 7-plus years of non-fading outdoor use.